Height 5 feet 3 inches. Weight 126 lbs. Chest measurement 32-34 inches. Complexion fair. Eyes grey. Hair brown. Sight and hearing good. Colour vision coreect. Limbs and chest well formed. Full movement of joints. Heart and lungs normal. Upper teeth false. Free from hernia, varicocele, varicose veins, haemorrhoids, inveterate or contagious skin disease. Vaccinated. Good bodily and mental health. No slight defects. Chunuk Bair (New Zealand) Memorial, Chunuk Bair Cemetery, Gallipoli, Turkey. Timaru Cemetery (memorial on parents' headstone). Panel 13. Timaru Cemetery - General Section, Row 83, Plot 159. 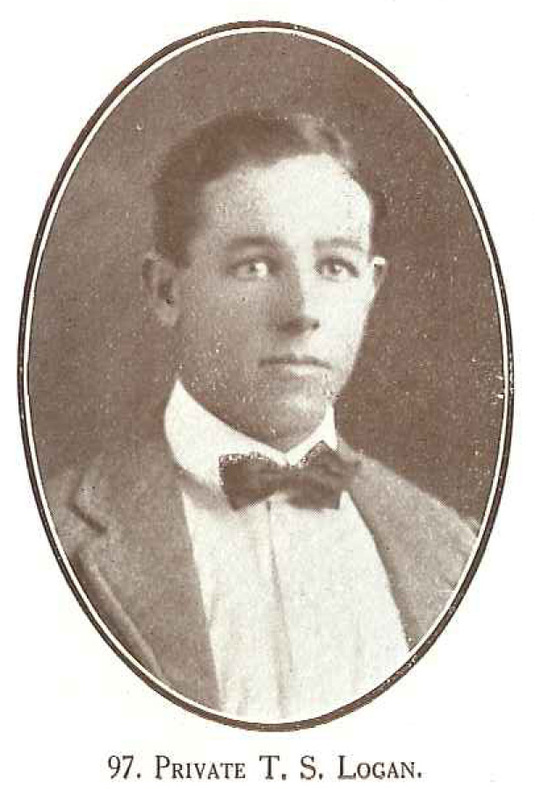 Thomas Stanley LOGAN, known as Stan, was born in 1889 in Timaru, the third son of John and Mary Jane LOGAN, of Timaru. Along with his brothers he was educated at Timaru Main School. At the time of enlisting Stan was a self-employed cabinetmaker; previously he had been working in the Wairarapa. Less than four months after embarking and just ten days after joining his Battalion at the Dradanelles, he was killed in action. His brother, George Hewish LOGAN, serving in the Australian Forces, was killed at Gallipoli the next day. Another brother Reuben Charles LOGAN also served in WWI, embarking with Stanley. S. T. Logan's name is inscribed on the Wesley Church Roll of Honour in the Bank Street Methodist Church. This Roll of Honour was unveiled at a very impressive service in early June 1915, after an address by the Rev. T. A. Joughin, opening with the words "Sorrow and pride mingle in the duty I have to perform" and while the "Litany for Army and Navy" was sung.